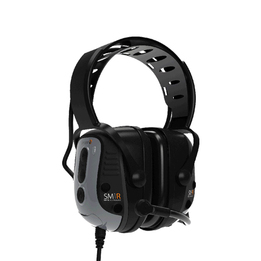 Sensear SmartMuff SM1RIS Intrinsically Safe Communications Headsets let you communicate face to face in high noise environments up to 95 db without the need to remove the muffs. Sensear SM1RIS headsets also let you plug into your existing two way radio for clear communications in noise environments up to 110 dB. And, because SM1RIS headsets are powered by your two-way radio, there are no batteries in the headset to recharge or fail just when you need them. No batteries also means the headsets are lighter weight for a more comfortable all-day fit. The SM1RIS headsets are also rated Intrinsically Safe for use in explosive atmosphere environments. Intrinsically Safe Certified to the following standards: TIA-4950-A, CSA C22.2 No.157.92, & UL 913 5th Edition with a hazardous location rating of Class I, II, III, Division 1 & 2, Groups A - G, T5, -25C to +60C. Noise canceling boom mic included. Supports 2-way communications in noise environments up to 110 dB. VOX (Voice-activated transmit capable. Breakthrough SENS® technology that lets you clearly hear and understand face-to-face conversations in extreme noise situations, while safely protecting your hearing. Sensear headsets also include BlueTooth connectivity for cell phone communications in extreme noise situations, plus connectivity to your existing 2-way radio and built-in 2-way short range FM radio!